Ingeborg Poffet accordeon, voice, composition, started to play several instruments and to sing at a very young age. She gave her first accordeon-concert at the age of four. Later she played classical and contemporary concerts both as a member of various orchestras and as a free lancer. Until '87 she took part at many training-colleges for concert-accordeon with Hugo Noth, Mie Miki-Schenck, Guido Wagner, Elsbeth Moser a.o. From 84 to 86 she studied computer music with Clarence Barlow at the Musikhochschule Cologne (Germany) and worked on different computer-music-projects. 1988 she took part at computermusic-seminars in Berlin and Cologne. Until '89 she conducted innovative new-music-projects, ’86-’89 she worked in electronical studios in Hamburg and Basel (Musikakademie) and as free-lancer sound-engineer (´88/´89 for Ensemble IGNM Basel, where she also played keyboard) and „Briefe aus dem toten Raum“ with Serena Wey, actress. Since 1979 member of various groups (accordion, vocals, keyboard, composition). She works with electronic, realizes computermusic and works as a recording engeneer and producer. She is creating new formations (together with her husband JOPO) and projects, compositions, concepts, multi-media-events and projects all the time. Sine 2007 she has developed several music-booklets for students (music-sudokus for kids and adults, beginners and players), released on AUGEMUS Musikverlag. As an author Ingeborg Poffet has written the librettos of 6 musicals (see Werkliste) as well as numerous lyrics for own songs. Her narrative "walking ways" (Wege gehend) has been published by the Novum Verlag, Austria. She has created more then 22 short stories, many of them already being performed on int. stages as "mean - music-crimes with Duo fatale", soon the book will be published as "mean". Her poems are often performed in multi-media-projects or cds like fiction - die Zeit, an elctro-acoustic-sound-poem or the Lyric-picture-hear-book lost cities / Verlorene Städte (2017). 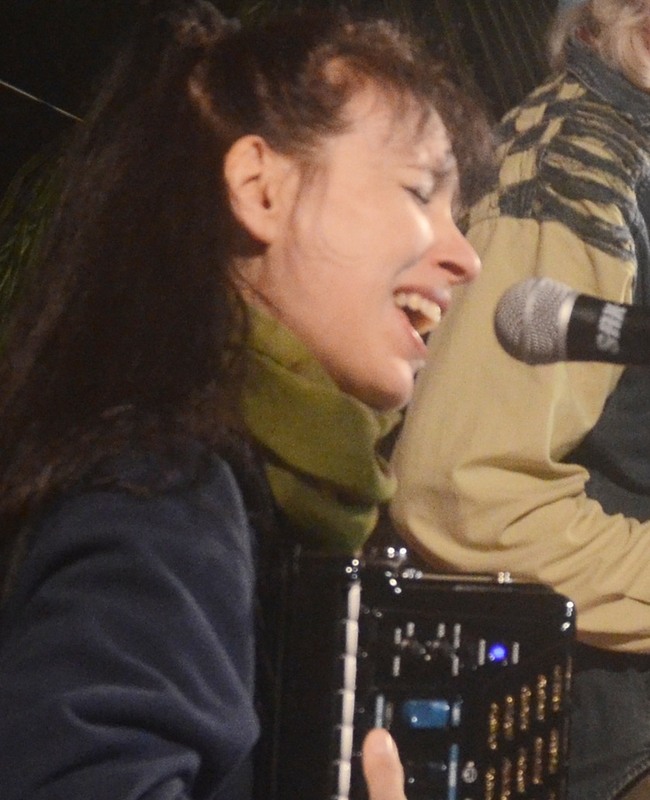 She teaches concert-accordeon since 1976 in her own style, theorie, voice and improvisation and leads workshops with eartraining, a cappella and mental training for musicians. multi-media works, sound-concepts/installations, theatre- and film-music, performances and musicals. The full list can be seen here on www.POFFETmusic.ch. The german AUGEMUS Musikverlag has published the sheets of the program Indian Book by JOPO und Ingeborg Poffet, as well as the Musik-Sudoku, zum Knobeln und Musizieren by Ingeborg Poffet, as well as Acht Miniaturen, Lösungspartituren der Musik-Sudokus, by Ingeborg Poffet and releases the serie "Die Klangbox", Musik-Sudokus zum Lernen, Singen, Spielen (und Aufführen), (for beginners/kids) Nr.1 - 4 and the Rapunzel- and Prinz Charming-Songs for instruments in C, Bb et Eb (2018). She has won various awards like Jugend Musiziert, Kunstkredit Basel, Alexander-Clavel-Stiftung, Prix Marguerite de Reding Improvisation 2001, Swiss Music Composition Contest 2009, schweizer Kompositionswettbewerb von Syntharp 2010/2011, SmartLearnPreis für Weiterbildung der Hamburger Akademie für Fernstudien 2014. She lives in Basel and France. Beside, she is naturopath, cert. nutritionist HAF & cert. phytotherapist ils. In her doctor's office "Naturheilpraxis Ingeborg Poffet" she's also having the special consultations for musicians. She played as accordion-soloist 1991 at sinfonietta-orchestra for children opera “der bunte Hund” and 1993 for the children-theatre-music-production “der Drache” both by Susanne Hinkelbein, at Klangkörper Schweiz Expo2000 Hannover, and with Agasul plus (Jürg Solothurnmann) and Elodie Lauton. She is busy in different cultural-political activities as management for XOPF-Records, organisation und partizipation of the int. XOPF-festivals Basel, delegate of the single-members Swissperform, 2011-2013 she's been the president of the forum of improvised music and dance Basel (FIM); she is member of the swiss association for music-medicin SMM. She releases numerous projects like books, CDs, DVDs, sheets and booklets. With her husband JOPO (saxophones, bassclarinet, composition) she has founded the group Duo fatale in 1989. In their exciting formation they have achieved a symbiosis of composition, interpretation and improvisation. Based in Basel, Switzerland, they both compose the music for all their groups and for command works such as theatre-or filmmusic or multi-media performances. They have frequently worked together with local musicians on their tours across the world. Tours in USA, Europe, Asia and Africa with participations at int. festivals. With Duo fatale meets international guests the formation meets local musicians from the Avantgarde, Ethno, Classic, Jazz or Rock all over the world.